There are two main topics of debates when it comes to education and social media: what should the student-teacher relationship on the web be? 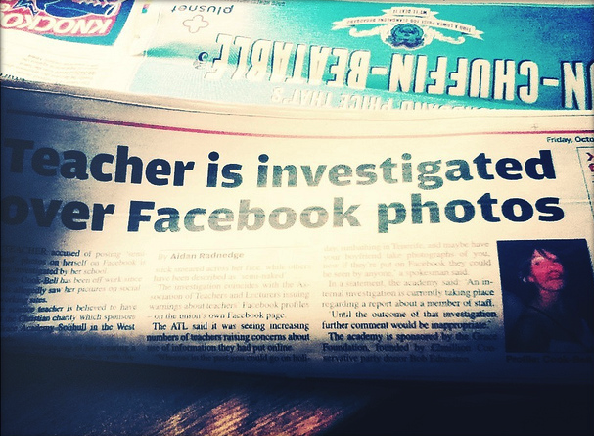 And should teachers use social media websites in their lessons? As social networking sites such as Facebook become more and more popular with students, school administrations are having a difficult time defining if teachers and professors should be able to use Facebook in their interactions with students. Some cite that it makes sense to go to where the students are, while opponents say that encroaching on students’ privacy or inadvertently leaving the door open for inappropriate behavior online can cause unforeseen consequences. Other school systems have their own policies, but overall, tolerable activities can include exchanging messages relating to a course or assignments, or creating a custom group for old classmates to reconnect. However, chatting about non-school subjects, posting certain pictures, or ‘poking’ maybe frowned upon. On the other hand, when Facebook is used correctly it can be a handy tool for teachers. According to Dr. Rey Junco’s blog on Social Media in Higher Education, the majority of high school and college students spend at least an hour and forty minutes per day on Facebook. Therefore, it makes perfect sense for educators to use the social network to connect with students and offer them a new way to learn and access learning content. In order to protect yourself (and your job), it is advised that teachers use a different email address and create a professional Facebook account rather than using their personal one. It seems obvious, but all teachers should interact with their students in a respectful, professional, and appropriate manner, no matter what the student says or does. You don’t want to end up in an NPR article like a teacher in Philadelphia, who was suspended after posting that students acted like “rude, disengaged, lazy whiners” or a Georgia teacher, who was forced to resign over a Facebook photo that showed her drinking alcohol. Just to keep things equal, students should be encouraged to do the same and use their school email address for school-related activity on social media sites. Facebook is like a giant game of telephone, you don’t always know what’s true and what’s false. Sometimes people hear about news, events, and products on Facebook first. I can’t tell you how many times I overheard a group of my seventh grade students discuss a current event they heard about in someone’s status. Just because it appears on the news feed doesn’t mean it’s factual. Of course, rumors have a way of going viral before misinformation is corrected. Teachers can give students, especially those in journalism or media classes, the opportunity to decide which information is legitimate and what are just assumptions, gossip, and hype. This is where critical thinking skills come into play. For example, students can search other more credible sources, such as CNN.com or their local newspaper’s website, to validate information they come across on Facebook. When I was in middle school we had to write biography reports about our famous authors or historical figures. Somehow I always ended up with Betsy Ross or William Henry Harrison, instead of someone cool. That project would have been so much more fun if we could have created a Facebook fan page or profile for that person instead and then shown it off on a projector screen in class. The Facebook Questions feature allows classes that study social studies, media, film, religion, politics, to use their own social connections on Facebook in order to conduct surveys and opinion polls. This is a great way for students to practice researching online and analyzing trends within their findings. The great thing about social networks is the networking aspect and chances are there are some groups and pages out there that are focused on issues relevant to your course. Teachers can suggest for students to type in a common subject, such as Algebra or the 2012 election, and then browse through the pages that come up. Type the name of your academic subject in Facebook’s search window and you’ll automatically get a list of related content, as well as, a way to connect with others who share your common interests. Teachers can also set up and monitor a Facebook group for their individual classes. This is a great way to distribute learning content and create a central place for communication for a course or class. Students especially love this idea because it gives them a space to discuss homework, upcoming tests, and share class notes. Share your opinion! What do you think about teachers using social media in the classroom? Is it a viable teaching tool? Should teachers and students converse online? What should the boundaries look like? Check out my domain sometime…. Generally, if the purpose is to “inform” or transfer information, I believe there’s nothing wrong if Teachers will use Facebook as a means of communication. The most important thing in social networking is to make sure you will not debulge all information about the user, only basic information. I think that teachers should be allowed to post whatever they want, say whatever they want, and take pictures of anything they want as long as it isn’t accesible to students and/or parents. There is no law that states “Educators are not permitted to use social networks during the duration of their career.” The Bill of Rights even gives the freedom or speech upon all the nation, so the school administrators aren’t obliged to take that freedom away. Hi there, I found your blog by way of Google while searching for a similar topic, your site came up, it seems to be good. I’ve bookmarked to my favourites|added to bookmarks.